In a difficult operating environment amid falling commodity prices, Russian companies are cutting costs and refocusing on domestic assets. Russia’s metals and mining industry, the country’s second-most important sector after oil and gas, has faced its share of adversity since the salad days of the past decade, when commodity prices were pushed skyward by a hike in demand from China and India. Today, as lower commodity prices put pressure on resource-producers around the world, many Russian metals and mining companies are nevertheless showing respectable profit margins, after shedding non-core operations and taking difficult steps towards rebuilding. Iron ore prices fell to a five-year low in September as Chinese demand slackened off and economic activity in Europe and Japan remained weak. Even so, for Russian firms, signs are emerging that, in some areas, the future may be looking a little brighter. “The global aluminum industry has turned a corner,” declared Rusal CEO Oleg Deripaska in a statement this summer after the firm, which produces almost 9% of the world’s aluminum, posted an income of $116 million in the second quarter of 2014. Those results marked the first time Rusal had reported a quarterly profit in over a year. Meanwhile, aluminum prices have been rising in the third quarter. “Positive price momentum is supported by strong fundamentals,” Mr. Deripaska said. Another hallmark of the sector is that Russian industries outside the realm of oil and gas are better insulated from the blast furnace of Russian politics than their cousins in the hydrocarbon trade. As U.S. and European officials pursue sanctions against Russian energy, arms and finance firms, the producers of Russian steel, coal, diamonds, iron, palladium, aluminum and potash labor quietly in the background — not fully removed from politics, but farther away from the heat. Coal, especially, may be due for a renaissance in Russia, thanks to new investment plans in the country’s eastern regions, even as coal miners in the U.S. and Australia face some of the most difficult years in the history of their industry. Russia, the largest land mass in the world, sits atop of some of the planet’s biggest reserves of minerals and natural resources. The Russian earth holds some 25 billion tons of iron ore, the third-largest reserves in the world after Australia and Brazil. High up in the frozen north, above the Arctic Circle, a company called Norilsk Nickel produces 14% of the world’s nickel and 41% of its palladium. Norilsk is also a top-four producer of platinum, with 11% of global output, and a significant player in the copper industry, with 2% of world supply. State-controlled Alrosa, the world’s biggest diamond miner, taps rich deposits in Siberia to yield 26% of global diamond production. Its South African rival, De Beers, is in second place with 22%. Despite years of tight control by the Russian government, Alrosa finally opened to public investment last year, raising $1.3 billion in an Initial Public Offering (IPO) on the Moscow Stock Exchange and reportedly selling some 60% of shares to U.S. investors. Russia is also the third-largest exporter of primary aluminum and steel and has the second-largest coal reserves in the world. Amid this trove of underground resources lie the crown jewels: the largest reserves of natural gas in the world and the eighth-largest reserves of crude oil. The outsized importance of oil and gas production in Russia to the country’s economy has led the Kremlin take a stronger hand there than in other commodities. Russia’s two largest energy producers – gas giant Gazprom and oil champion Rosneft – are both majority state-owned. But many of the large Russian extractive firms outside of oil and gas are privately held by owners who have also sold significant minority stakes to international investors via stock exchanges in Moscow, London and New York. Efforts have been underway among Russia’s big steelmakers to sell assets, cut costs and refocus their efforts domestically. To be sure, net profits are less frothy than another indicator of underlying profitability, known as “earnings before interest, tax, depreciation and amortization,” or EBITDA. Novilipetsk Steel, commonly known as NLMK, became the world’s most profitable large steelmaker in August after cutting costs. According to Bloomberg data, the firm’s most recent results yielded an EBITDA of $584 million for the second quarter, a margin of 21%, beating 24 of its biggest peers. Severstal, the steel and mining firm majority-owned by billionaire Alexey Mordashov, had previously been in place among that top 25, with a 19% margin, according to Bloomberg data. This summer, Severstal reached agreements to sell its North American assets in Columbus, Miss., and Dearborn, Mich., for a total of $2.3 billion, and used $1 billion of the funds to pay a special dividend. 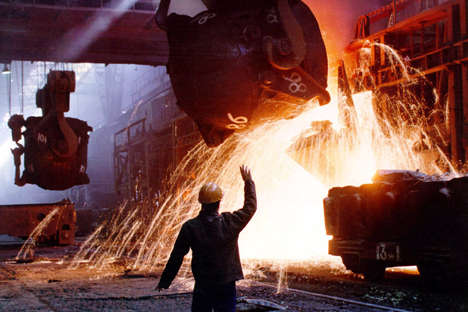 Mechel, the indebted coal and steel producer, is considering selling $2 billion to $3 billion worth of assets to help pay down over $8 billion in debts, its CEO Oleg Korzhov told Moscow’s Vedomosti newspaper in September. Mechel is in talks with state banks to restructure its debt. Russian news agency ITAR-TASS has reported that the government has approved two bailout schemes that would allow the firm to avoid bankruptcy. Rusal emerged as Russia’s champion of aluminum after consolidating the assets of smaller competitor SUAL and of international commodities trader Glencore in 2007. Today, Rusal operates in 19 countries on five continents, and is headquartered in Moscow. According to Rusal, global consumption of aluminum rose in the first half of 2014 to 27 million tons, up 6% in comparison with the first half of 2013. The fastest growth in demand on aluminum was in China (13%), Japan and South Korea (10%), and Central and South America (5%). “The completely gloomy picture of the aluminum market in the beginning of the year has changed today to a rapid price increase,” says Ilya Balakirev, chief analyst at Moscow brokerage UFS IC.